In this current state of technology, every impossible is becoming possible now. As technology is changing and advancing day by day, so as the innovation. The creativity and innovation is the best combination for any new invention. 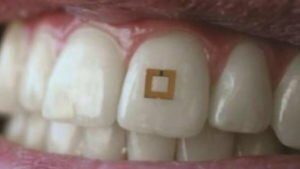 You might be surprised to listen that tooth sensor has been discovered to keep track of what you eat and drink. Get shocked? yes, this is possible now! The idea was given by the researcher of the Tuft school of engineering USA. They are highly supported by the army and the navy forces which encourages them to work hard. It can detect the all the things you eat by saving the particles in the middle layer. A message will be sent about what you eat detected by the sensor. The message (signal) will be sent to the mobile to show you what you are eating along with all the measurements at the current time. This is probably the great invention of this year. As technology changes adeptly, we hope that more and more useful things can be produced in coming years.